Since routing is a fundamental operation in all types of networks, ensuring routing security is a necessary requirement to guarantee the success of routing operation. Securing routing task gets more challenging as the target network lacks an infrastructure-based routing operation. This infrastructure-less nature that invites a multihop routing operation is one of the main features of wireless sensor networks that raises the importance of secure routing problem in these networks. Moreover, the risky environment, application criticality, and resources limitations and scarcity exhibited by wireless sensor networks make the task of secure routing much more challenging. All these factors motivate researchers to find novel solutions and approaches that would be different from the usual approaches adopted in other types of networks. The purpose of this chapter is to provide a comprehensive treatment of the routing security problem in wireless sensor networks. The discussion flow of the problem in this chapter begins with an overview on wireless sensor networks that focuses on routing aspects to indicate the special characteristics of wireless sensor networks from routing perspective. 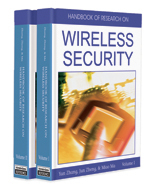 The chapter then introduces the problem of secure routing in wireless sensor networks and illustrates how crucial the problem is to different networking aspects. This is followed by a detailed analysis of routing threats and attacks that are more specific to routing operation in wireless sensor networks. A research-guiding approach is then presented to the reader that analyzes and criticizes different techniques and solution directions for the secure routing problem in wireless sensor network. This is supported by state-of-the-art and familiar examples from the literature. The chapter finally concludes with a summary and future research directions in this field. Intrusion: Can be defined as a set of actions that can lead to an unauthorized access or alteration of a certain system. DoS Attack: Any event that decreases or eliminates a network’s capacity to perform its expected function is termed as a denial-of-service attack or commonly known as DoS attack. Reputation System: A type of collaborative filtering algorithm which attempts to determine ratings for a collection of entities, given a collection of opinions that those entities hold about each other. Wireless Sensor Network (WSN): A wireless network consisting of spatially distributed autonomous devices using sensors to cooperatively monitor physical or environmental conditions, such as temperature, sound, vibration, pressure, motion, or pollutants at different locations. Routing Attacks: Network layer attacks such as routing information spoofing, alteration or replay, blackhole and selective forwarding attacks, sinkhole attacks, Sybil attacks, wormhole attacks, HELLO flood attacks, and acknowledgement spoofing. Routing Security: Securing routing operation from attacks in a network by deploying appropriate defense. Trust: A relationship of reliance. Trust is a prediction of reliance on an action, based on what a node knows about the other node, in the context of wireless sensor networks. The notion of trust is increasingly adopted to predict acceptance of behaviors by others. Key Management: A scheme to dynamically establish and maintain secure channels among communicating nodes. In wireless sensor networks, a key management scheme must deal with the following important issues: key deployment/key predistribution, key discovery, key establishment/key setup, node addition/rekeying, and node eviction/key revocation.